As murmurs of a Spotify IPO emerge, another tech giant is entering the music-streaming space. Coinciding with the kickoff of SXSW Interactive on Friday, Samsung launched Milk Music, an ad-free music streaming service with no subscription fees for Galaxy phone owners. To distinguish itself from the increasingly crowded music-streaming landscape, Samsung designed the service to be as easy to use as possible. To accomplish this, no user name or setup is required to get started, and the service won’t roll any ads. “To start listening to music, it’s long and painful. Consumers have to sign up for the service, provide a user name and password, preferences for music, proactively add information like an artist, album, or song they like,” said Chris Martinez, director of services planning at Samsung Telecommunications America. Milk Music touts a catalog of 13 million songs and 200 genre-based and curated stations, which means users can’t listen to specific tracks or entire albums on demand. Designed to resemble terrestrial radio, the app features a dial with haptic feedback that users turn to find stations they want to listen. “There’s no buffering as you go from station to station,” Yu said, adding that the service, which is powered by Slacker, caches eight seconds of the next song. 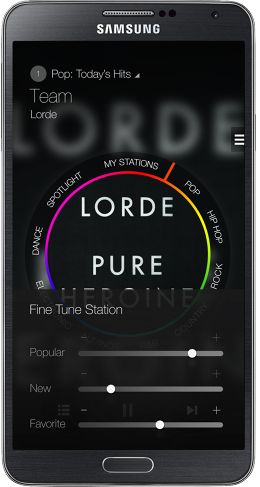 Though the service has parallels with Pandora, the app has customization features so users can specify what genres they don’t want to listen to, if they prefer more popular or obscure songs, and if they want to listen to newer or older titles. Without ads or subscription fees, Yu said the goal of this service isn’t to drive revenue, but to “be a value add.” Given Samsung’s dominance in smartphones, it seems like a lost opportunity the app won’t be preloaded on its devices. Milk Music will be available for download on Google Play to owners of the following Samsung products: Galaxy S4, Galaxy S III, Galaxy Note II, Galaxy Note 3, Galaxy Mega, Galaxy S4 Mini, and Galaxy S5, which will ship in in April. So, yeah, pretty good week for Samsung, eh?